The Giro d'Italia and Gran Fondo Giro d'Italia, are just one week apart, May 17 Gran Fondo Giro d’Italia and the May 24 Corsa Rosa Queen Stage, from Pinzolo to Aprica. 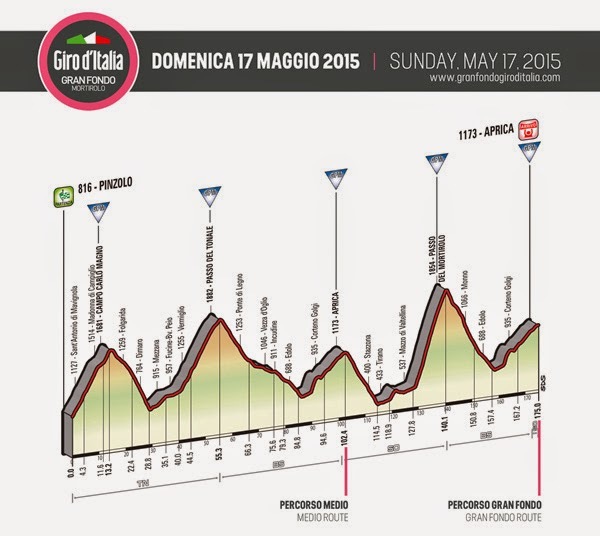 This will allow gran fondo (sportive) riders to compare climbing times with the professionals. The legendary Passo del Mortirolo climb will be timed on both the Giro d’Italia and the Gran Fondo Giro d’Italia, and the climbing times are to be published on the events websites www.giroditalia.it and www.granfondogiroditalia.com. The timing of the Passo del Mortirolo starts at the ‘climb start’ signpost and runs until the 1,854m summit where the King of the Mountain sign will be positioned. The comparison may be an extremely tough challenge, but the rare chance to compare a sportive rider’s climbing time with the pros on the exact same route in such a short period of time is a real treat. From Pinzolo to Aprica (175km) facing the climbs of Campo Carlo Magno, Passo del Tonale, Aprica (first passage), Passo del Mortirolo and the final climb to Aprica. The Gran Fondo Giro d’Italia offers two route options for sportive cyclists: the Gran Fondo long route of 175km, and the medium route of 102km which finishes after the first arrival at Aprica. To participate, non-Italian resident riders must either be registered to a national cycling federation, or have a registration recognized by the Union Cycliste Internationale, or hold a medical certification for the race. The cost for non-Italian residents to register for the event is €90 + €20 for transport (optional). Registrations will be closed on April 30 2015. Due to the start and finish being in different locations, the organizers offer a number of different transport options for riders and/or their bicycles. A secure area for bikes will be provided in Pinzolo. -For those who wish to sleep in Pinzolo (at the start): at the end of the race you have the option to return on a coach service leaving from Aprica either at 17:00 or after the broom wagon’s arrival at the finish. -For those who wish to sleep in Aprica (at the finish): a coach service with bicycle transport will leave at 05:00, taking you to the start location. -For those who wish to leave the car in Aprica (finish) and sleep in Pinzolo (start): a coach service with bicycle transport will leave on Saturday 16 May at two different times: 15:00 and 18:00. Baggage will be delivered back from Pinzolo to Aprica with a dedicated van service, to be delivered to the start no later than 07:30.